Hospital stocks surge, while insurers sell off after Supreme Court upholds Obama health care reform. NEW YORK (CNNMoney) -- Health care stocks were sharply divided Thursday, with hospital stocks rallying after the Supreme Court upheld President Obama's health care reform bill. "Hospitals are going to be compensated for the uninsured that they cover," said Robb Granado, senior analyst at Sageworks. "No matter how you shake it, it's a positive for hospitals. It takes away a lot of uncertainty." Hospital operators, and companies that own hospitals, celebrated the ruling. HCA Holdings (HCA, Fortune 500), United Health Services (UHS, Fortune 500), Community Health Systems (CYH, Fortune 500), Health Management Associates (HMA, Fortune 500) and Tenet Healthcare Corp (THC, Fortune 500) surged between 5% to 10%. Providers of Medicare and Medicaid also got a substantial lift. 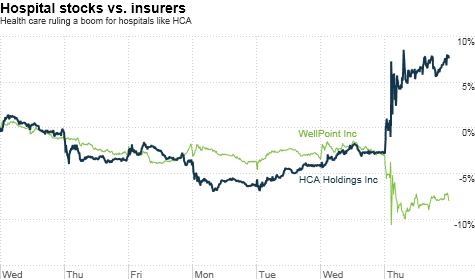 Wellcare Health Plans (WCG, Fortune 500) rose 9% and Amerigroup (AGP, Fortune 500) jumped 5%. Centene Corp. (CNC, Fortune 500) rose 2% and Molina Healthcare (MOH, Fortune 500) rose 9%. The ruling had the opposite effect on health insurances stocks, which slumped significantly. Wellpoint Inc. (WLP, Fortune 500), Aetna Group (AET, Fortune 500) and Cigna Health Group (CI, Fortune 500) all dropped between 3% to 5%. Unitedhealth Group (UNH, Fortune 500) eked out a 0.5% gain, while Humana Inc. (HUM, Fortune 500) was flat. "I think HMOs and pharma are being unfairly hit, because they actually benefit after 2014 from more patients," said Les Funtleyder, healthcare fund manager at Pollywog. 2014 is when health care reform kicks in, resulting in a higher number of insured Americans, which should be a boon for insurers. Big Pharma were mixed for the day. Merck (MRK, Fortune 500), Johnson & Johnson (JNJ, Fortune 500), Eli Lilly (LLY, Fortune 500) rose slightly, while Pfizer (PFE, Fortune 500) and Bristol-Myers Squibb (BMY, Fortune 500) edged downwards. Among other things, the health reform bill mandates that by 2014 all states set up a health insurance "exchange" -- an online marketplace where consumers who are underinsured or uninsured will be able to shop for subsidized coverage, and small businesses can buy more affordable plans for their workers. President Obama and Mitt Romney, the Republican nominee for president, offered equally disparate perspectives on the Supreme Court ruling and its economic impact. Obama called the Supreme Court decision "a victory for people all over this country, who will be more secure because of this law," while Romney called it "bad policy" and a "job killer." The ruling also affected exchange-traded funds (ETFs) in the health care sector. iShare Dow Jones U.S. Healthcare Provider (IHF), an ETF focusing mainly on health insurers, was up 1.5%. Health Care Select Sector (XLV), a broad fund that owns most of the major players in health care, slipped 0.5%.